It’s almost time! This week I’ll finish sending chapters of The Last of the Ageless to my beta readers. So I thought it might be a good idea to let you know when I plan to publish these blended science fiction/fantasy short stories and novels. Two Years’ Worth of Books!?! Halloween really is the best time of the year, when even non-geeks dress up and role-play as all manner of spooks. In keeping with last year’s tradition, Dorian and I — along with some pals — attended the Geek Gala put on by the esteemed Charlotte Geeks. 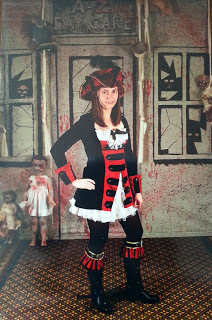 I dressed as a pirate. They had a great backdrop reading “A – Z-ombies Day Care” for photos.